Animals don’t stray and know how to be discreet. They want us to give them space and handle accidental face-offs better. The recent headlines — a leopard ‘running amok’ in a Bangalore school or a ‘rampaging’ elephant in Siliguri — have triggered fresh debates over why wild animals are ‘straying’ into human spaces so frequently. Animals — wild or domestic — seldom, if ever, stray. Trust them to know where they are going and their ways. Try abandoning your pet miles away and see how it shows up back at home. The leopard spotted in a school in Bangalore’s Marathahalli, for example, could not have lost its way. In all likelihood, it was using the area for a long time – roaming the city streets in the night to opportunistically prey on dogs and using the green patches around the Varthur lake as its day shelter. However discreet, the Marathahalli cat blew its cover one unfortunate morning. Both people and the animal panicked. And all hell broke loose. Elephants obviously face a bigger challenge to stay invisible. They require a lot of food which forces them to migrate seasonally across considerable distances. The herds stick to traditional routes, and increasingly run into manmade barriers and trouble. Of course, some herds do raid villages for food and such campaigns can also get violent if the animals face aggressive resistance. Elephants do not march in single file while migrating. They disperse to forage individually or in small groups before combining as a herd only to disperse again. It is during these dispersals that a relatively young elephant or a lone bull can find itself in unfamiliar territories — thanks to rapid changes in land use — and panic. In such situations, collective or individual memories of persecution at the hand of hostile communities, some experts claim, can make certain elephants particularly aggressive. Across north Bengal, the elephant’s traditional migrating landscape between Sankosh (Bengal-Assam border) and Kosi (Nepal) rivers is severely fragmented by settlements, agricultural plots and military infrastructure. 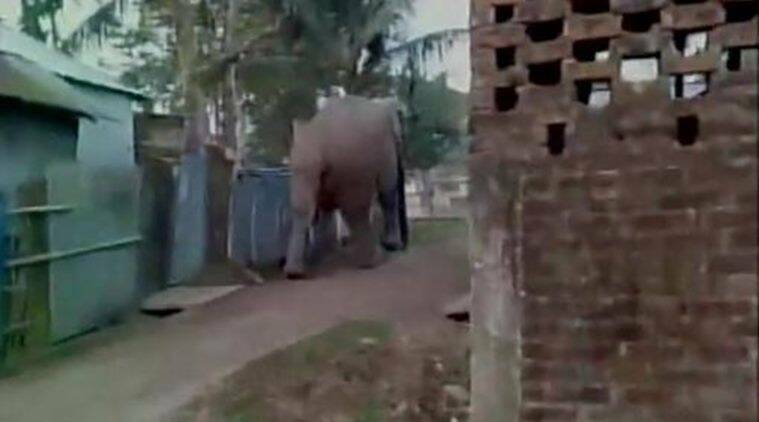 The result is disproportionately high man-elephant conflict — less than 2 per cent of India’s elephant population involved in more than 20 per cent of recorded altercations. It is difficult to theorise when we have an elephant in a city or a leopard inside a school. While dealing with emergencies, strict crowd (and media) management and professional immobilisation can reduce casualties. But unless we give the wildlife space and not panic to retaliate at the mere sight of it, only management initiatives may not be enough to reduce conflict.